Libraries All Party Parliamentary Group says 'it is vital that all schools have a good library to ensure children develop essential literacy and digital literacy skills'. A cross-party group of MPs and peers has called for there to be a good library in every school in the UK in a new report which says that libraries make "a huge contribution to young people's educational attainment". 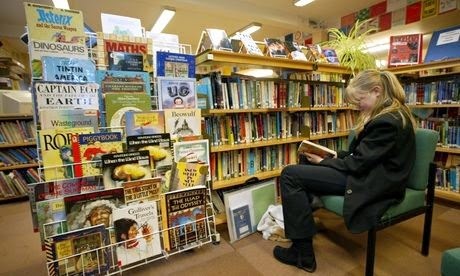 The call follows a long-running campaign from authors, who believe primary and secondary schools should be required by law to have a school library and a trained librarian, and comes in the wake of new figures from the Department for Culture, Media and Sport showing a "significant decrease" in the number of adults using a library. In the year to March 2014, just 35% of adults had used a library, compared to 2005/2006, when 48% had used a library, said the DCMS's Taking Part survey . The new report, The Beating Heart of the School, comes from the Libraries All Party Parliamentary Group, and states that "it is vital that all schools have a good library to ensure children develop essential literacy and digital literacy skills in order to fulfill their potential". Although there are no new figures about the number of school libraries in the UK, the report says recent surveys show that 40% of primary schools with designated library space have seen their budgets reduced, and that almost a third of libraries have insufficient space. It also pointed to "one of the most concerning trends": the fall in the number of librarians in English schools, with data from the Department for Education showing a reduction of 280 librarians in two years. "Every child growing up in the UK should have the chance to learn and develop through a good school library. Poor literacy skills stand in the way of children and young people achieving their potential. In an increasingly digital world, we need to teach young people how to evaluate and understand unprecedented amounts of information," writes Liberal Democrat Lord Graham Tope, chair of the group, in an introduction to the report. "With one in six adults in the UK struggling with literacy, more must be done to equip young people with essential literacy skills. I would expect the best schools to have a fantastic library; we need to ensure that every pupil across the UK has a library that is fit for purpose in their school." The report also states the need for Ofsted to look at school library provision when they inspect a school, and for the Department for Education to start collecting figures about the number of schools that have a library and librarian. It was welcomed by schools minister David Laws, who said that "the school library is an incredibly important way to ensure that children have a good choice when choosing books, a dedicated space for reading, and effective encouragement and stimulation from librarians to develop their literacy skills". School librarian Barbara Band, president of librarian body CILIP, pointed to research from the National Literacy Trust which shows that one in three children do not have a book of their own at home, and to a study from the Reading Agency which indicates that 40% of five to 10-year-olds and 23% of 11 to 15-year-olds do not visit public libraries. "This means the only place that many children encounter books is at school. Because school libraries are not statutory, not all schools have a library. Other schools think they have libraries when all they have is a room full of books," said Band. "The provision of school libraries must not be left to chance because it is children who are the ultimate losers." Authors have also called on libraries to be made a statutory requirement in schools, with chief executive of the Society of Authors Nicola Solomon writing to shadow culture minister Harriet Harman in May about the issue, saying that "prisons have a statutory obligation to provide a properly-staffed library and access to books but, absurdly, there is no such obligation in relation to schools". Meanwhile library campaigners continue to fight closures in authorities across the UK. In Devon, campaigners borrowed hundreds of books from Braunton library at the weekend in protest at planned budget cuts, the BBC reports, while people protesting closures in Lincolnshire were at the High Court in London on Tuesday as a judicial review began.